Isaac Decator Gwartney is Kevin's first cousin, three times removed - not a direct ancestor. However, his daughter, Rebecca Gwartney Sidwell, wrote a fairly long biography of his life. Many of our ancestors of the time probably had similar experiences. Isaac Decator Gwartney was born 1 Mar 1879 at Decatur, Arkansas, son of Rebecca Alice Davis and John Gwartney. He went to a country school near Decatur for two terms. The family moved to Pryor Creek, Indian Territory, in Dec 1888. This was later called the state of Oklahoma in 1907. In 1889 they rented land from the Cherokee Indians. Between 1888 and 1900 he completed two more short terms of school which was all the schooling he received. His parents moved around quite a bit. They rented in the fall, but never gained possession until spring. The boys would go to the place and batch and plow and plant fall wheat. 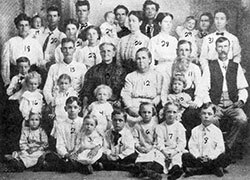 The family moved to Kansas in Dec 1900. My grandfather, John Gwartney [Kevin's 3rd-great uncle], was never well. He was a veteran of Civil War, and had a bad shoulder wound. Therefore, it was up to the boys to do most of the farming. My father's older brothers, Ora and George, were not as reliable as they should have been. George was lazy and wouldn't do it at all and Ora was good to help except when he took a notion to go someplace. My father said he did most of the work for the family and never took any share of the crop and even worked extra and bought his own clothes. He stayed home and supported the family until he was 25 years old and he had a deep satisfaction that he did all he could to help. When my father was a young boy he helped on the farm all day long. While binding grain he rode the two lead horses while his father drove three mules behind. He tells of once when they ran away. His father got off the binder for something and laid the lines down. When the mules seen he was gone they ran away just for meanness. Then the horses would get scared. They ran so fast they would lift the binder right off the ground for about 15 feet and when it came down it would plow into the ground for about 20 feet, then it would go through the air again. One time they broke something and it fell into the wheels and locked them and they stopped, another time one of the horses fell under the binder and stopped them, but he always rode them out. These experiences made him afraid of horses and any team that acted like they might run away completely unnerved him. In my childhood I remember having only very gentle workhorses. My father said he always got Saturday night off. They went to town or to some of the relatives. They never worked on Sunday and went to church when a church was available. This family got along with each other extremely well. My mother says she never had a bit of hard feelings with the parents even when around them a great deal. Isaac met Hattie May (Mae?) Ryan at a dance. 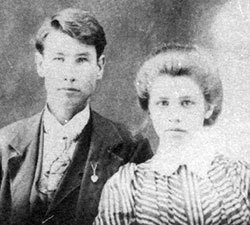 They were married 29 Dec 1904 at Pineville, MO by Rev. Zack Baker. Her father was not in favor of the marriage because she was needed at home. Two children, Noel Vernon and Viva Nora were born at Mound Valley, Labette Co., Kansas. They then moved to Cherry Vale, Montgomery Co., Kansas in the fall of 1908, Ruth Isabell was born here. They observed Halley's comet in 1909. It was visible for about two months. They then moved to Hiwasse, Benton Co., Arkansas in the spring of 1910. Mable Odan and Oral Wayne were born here. In 1910, they bought a place for $600.00. They borrowed $400.00 from Isaac's father and sold some hogs and other things and built a new house for approximately $600.00. They bought an old church house for $100.00 and used part of it for the house and the rest they got from the mill. It was 26 x 28 and they were very proud of it. My father built it himself in his spare time. They moved into it in 1914. They had been living in an old house consisting of one room and a lean-to. In November 1915, someone came along and offered them $1600.00 for the place so they sold it for cash. Mother was baptized in 1911, and my father in May 1914, in the Christian Church at Hiwasse, Benton Co., Arkansas. Both were baptized by Rev. Edward Hale. He had farmed all the time until returning to Cherry Vale, Kansas, where he worked in the smelter until 1 Jun 1916. Then, they bought a covered wagon, team and harness and went to Stafford, Kansas to work in the harvest fields. Aunt Maggie, my father's sister, and her family went with them. All remember it rained very hard and everything was wet. My sister, Mable, remembers being afraid of the frogs. This did not work out as well as expected, so the family returned to Jay, Delaware Co., Oklahoma in August 1916. My mother came down with Malaria in Nov 1916. In 1919, in Kansas, Oklahoma, they had bought a small farm. The summer of 1918 produced a short crop due to drought. They didn't raise enough feed to take the cattle through the winter. They bought hay as long as there was hay to buy and hauled in about 15 miles. Altogether they had about thirty head of cattle. The cows took a kind of flue and 27 head died. Also, two brood sows, with five pigs apiece, died. A mare died, too. By Feb 1919, they had one team, a milk cow, a bull calf and a heifer left. All the family had the flu (this was the great epidemic when so many people died) but my father. He went from one to the other with medicine and took care of the five children, my mother, and skinned the dead cows. Mother's flu developed into pneumonia and she never got out of bed until May. Next April of 1920 Mother broke out with pellegra. She was very ill and was given up by doctors. My father heard of a remedy some distance away and it took him three days on horseback to go get it. (I have a letter written to her from this company.) They gave it to her a teaspoon at a time and she gradually got better. In the winter of 1921, on Feb 19, the house in Kansas, Okla caught on fire and burned to the ground. My mother was still so weak she couldn'tset up alone, but after she had smelled smoke and awakened my father, she got up and crawled out the window. He went to get the children out. Noel was staying with a relative, but the rest of the children were sleeping upstairs. He managed to get Oral and Mable out. Oral was severely burnedon the leg, and Mable was burned about the head and lost most of her hair. Mother held on to them while my father tried in vain to rescue Viva and Ruth. The roof fell in just as he climbed down off the ladder. Their bodies were found on the stairs and their casket was about the size of an orange crate. They were buried together in the cemetery at Kansas, Okla. The family then moved to Gravette, Ark. Rebecca Ellen (me) was born here. Mother sat up with Ora, who had pneumonia, the night before I was born. I was born 4 Feb 1922. My mother told me of the circumstances surrounding my birth. She awoke at 10 till 2 a.m. and told my father to get up and build a fire. He went out to get some wood and when he came back into the house, I had already arrived. He said, "Why, mom." (A statement, not a question.) She said, "Turn her over." He did, and went to call a doctor. We laid there as such until he came. On April 16, 1923 in a 1917 Model T Ford, the family started West for Idaho. Grandpa Ryan had been here and told them of opportunities here. After one day of travel they stopped at Pittsburg, Kansas an camped in the yard of Aunt Minnie King. Next day, Mable came down with the measles. Noel had had them 21 days before they started out, and they thought sufficient time had elapsed and the rest were not going to get them. Because Aunt Minnie had children and a new baby, they could not go there. My father found a woman who let them bring Mable into her home, while he found a room for the family. They stayed there about 10 days while Oral and Rebecca had them. After one more days travel, it started to rain and they had to stop two nights and a day at Osawattma, Kansas. Next days travel took them to Manhattan, Kansas where Golden and Cecil Ryan (brothers of my mother) were in college. They traveled on to David City, Nebraska where they visited Terrance Ryan, another brother of my mother's. The next day, after leaving there, a bearing burnt out and after having it repaired, they drove on for about two hours and two more burnt out. It was caused from the sand from the road getting into the bearings. In Cheyenne, Wyo, the family ran out of money. My father looked up an old acquaintance in Fort Collins, Colo. After failing to find a job, they wired the bank in Gravette, Arkansas, which sent them $100.00 without security. They took up the trail again and probably took a couple of day sto reach the shores of Bear Lake, where they camped for one night. On their last night out, they camped where the American Falls dam is now. The last two days they patched tires time after time. Finally, at Wendell, Idaho one went completely, so they went on to Gooding on the rim. They reached Gooding, May 29, 1923 with 30 cents. On May 31, he found a job in Wendell on a farm working for Al Faucett. Noel worked for Harrison Ryan (another brother) for $75.00 a month. In the winter of 1923 and 1924, Noel and my father worked at the W.S. Khun ranch. In 1926 my parents moved to a farm south and west of Wendell. They farmed 3 farms in this same area until 1935. For many years my mother was ill with blood tumors. She had several minor operations (D&C), but still spent much of her time in bed, too weak to do much of anything. These minor operations were performed without anesthetic and were very painful. I can remember my father saying that maybe in the fall we could get this or that, whatever we might need or want, but each year it took all he had made each year for the hospital or doctor bills. When I was about 10 years old, she had a major operation, a hysterectomy. In those days, very few of these were done, and she was on the operating table five hours, and it was uncertain whether she was strong enough to stand it. But, after that she began to improve and felt better than she had for many years. On Oct 16, 1935, my parents had a public auction sale and sold out. On 31 Oct 1935, my parents took me and we returned to the old home states to visit. I was taken out of school, but took my school work with me. I was in the eighth grade, and I had to really study to keep up so I could graduate with my class. We moved to Jerome, Idaho 9 Dec 1935. I had been absent from school six weeks. We lived in a small house in town until Mar 1936, when we moved to a farm four miles north and 1/4 west of Jerome. They lived here until Jan 1941, and then retired and moved to Jerome to 401 5th Ave West. In Oct, 1955, the folks sold their place on 5th Ave. West and moved into our old home on Buchanan St. We had just built a new one. My father died in 1958, and then Mother moved into a small apartment, where she lived until shortly before she died. She died in Dec 1966, of cirrhosis of the liver. My parents celebrated their 50th wedding anniversary in 1954. My father was a very intelligent man, if he had been educated, would probably have been more learned. He read a lot, almost anything he could find to read, and had read the Bible several times. He looked a lot like many of the Gwartney pictures I have seen, there is a certain resemblance they all have. He was very sensitive, extremely aware of the feelings of others, would not think of hurting anyone's feelings. He almost never got angry, I can only remember him getting angry one or two times in my whole life, once at me, which I surely deserved. He never swore, I never heard him swear. I loved my Father dearly, and from my earliest childhood, I was at his heels. I never remember him getting out of patience with me. He was troubled with arthritis in his later years, especially in his shoulders and his hips. He walked with a cane, and it was painful for him to go very far. He had a cataract on one eye which let him see only a small portion to one side. In those days, an operation was risky and guaranteed nothing. He was setting reading in front of a window one day, a blood vessel burst in the other eye, and left only a small portion of sight to the front. This ended his days of reading. After that he could watch a little television, and see to get about, but that was about all. He died 30 Sept 1958, while visiting Mable at New Plymouth, Idaho. The cause of death was Edema, his lungs filled with water. He is buried at Jerome, Idaho. Jerome - Oct 1 - Isaac D. Gwartney, 79, died at the home of his daughter, Mrs. Byron Tilby, New Plymouth, Tuesday evening after a short illness. Mr. Gwartney was born at Decatur, Arkansas, March 1, 1879. He married Hattie Ryan, December 28, 1904 at Pineville, MO. The family moved to Jerome in 1935. Surviving besides his widow are two daughter, Mrs. Byron Tilby, New Plymouth, and Mrs. Wayne Sidwell, Jerome; one son Noel Gwartney, New Plymouth, 15 grandchildren and 12 great grandchildren, and two sisters, Mrs. Gertie Gott, Los Angeles, and Mrs. Maggie Wilson, St. Johns, Kansas. Funeral services will be held at 2 p.m. Friday at the Wiley Funeral Home with the Rev. Ralph Wiley of the Valley Christian Church, Twin Falls, officiating. Friends may call from 1 until 9 p.m. Thursday and until time of service Friday at the chapel. Final rites will be held at the Jerome cemetery.